Students at Wright State University have an average of five years of work experience, but students are accepted with much less. Applicants must submit GMAT scores, a resume, and three references; letters of recommendation are not required. Students who already have completed a master's degree in another discipline do not need to take the GMAT. The ...Students at Wright State University have an average of five years of work experience, but students are accepted with much less. Applicants must submit GMAT scores, a resume, and three references; letters of recommendation are not required. Students who already have completed a master's degree in another discipline do not need to take the GMAT. The admission office ranks students according to an admissions index (College GPA X 200 + GMAT Score) and requires a minimum of 1,100 points for acceptance, though many students score much higher. The average undergraduate GPA for last year's incoming class was 3.15. The average GMAT score was 500. International students must submit a translated transcript where necessary, and if their primary language is not English, they must also take the TOEFL. “Wright State University attracts students that are truly interested in their education.” Students are “extremely hard-working and motivated, dedicated, and passionate about improving their breadth of knowledge and applying this to make a difference.” The student body is a “mix of those just out of college undergraduate studies, students with a few years of experience, and students who have been in the workplace for a long time,” and “many are pursuing a second or third master’s degree.” The student body at Wright State is also “very diverse.” One student says, “You can meet hardworking students of all colors, nation­alities, genders, ages, etc., in your classes.” You’re guaranteed to hear “different perspectives on issues,” and students report that being exposed to “different viewpoints and life experi­ences enhances their learning experience.” Since the majority of students work full time and have demanding home lives, many of them don’t have the opportunity to socialize with their peers. “I just drive to class after work and go to school and go home,” one student explains. An upside of this is “the majority understand what each other are going through and are willing to help.” Though many do disappear after class, one student says, “The lobby in the business school is always full with students socializing and working on school-related activities and projects.” There are many business-oriented clubs, such as those dedicated to accounting and finance, as well as all kinds of organizations and intramural teams offered by Wright State University, should stu­dents find themselves with some free time. Many Wright State students are already employed and are receiving tuition assistance from their current employers, so lots of students in the program aren’t hoping to score a new job after graduation. Those who are, however, will benefit from Wright State’s Career Services center, which actively works with local companies to determine their staffing needs. The Center hosts recruiting and networking events, as well as onsite interviews, and it provides personal career counseling. “Professors, administrative staff, and alumni are always willing to help any student in the job hunt” as well. Some students would like to see Wright State put more effort into its career services for business students and increase alumni network­ing opportunities. 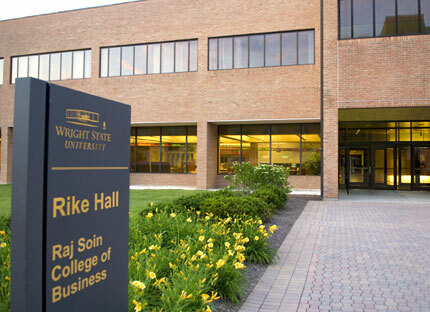 Want more info about Wright State University College of Business and Administration Full Time MBA? Get free advice from education experts and Noodle community members.